(1)Who is responsible for managing the community. 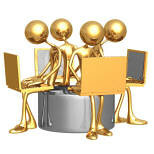 One person who has ultimate authority for managing your online community. Pick this person before you launch. What are the limits of their authority. What can/can’t they do without you? What are their responsibilities and deliverables? (3)What you’re going to tell them. Based upon your research, you should know what you’re going to tell a member that will get them to join. We believe it is best to draw up a plan for publishing content according to a table -of -contents and in a timely fashion. (4)How you will convert newcomers into regulars. What will members do in your community for the first few weeks? You need a clear process that will take a newcomer to the community past the usual 3-week mark into a regular. This means a combination of constant prods asking for opinions/recommendations etc. (6)How you will grow the community. Will you continue to use direct invites? Will you use referrals? If so what will you do to gain those referrals? Will you go for promotion/mentions in top media outlets. If so, what will you tell them to get those mentions? In our opinion, it is better to grow physician communities via referrals and recruiting health consumers via direct invitation, social media marketing and Google adwords. (7)What platform you will use. Hot topic, but what platform will you use for your community (should be very clear about why). The default should be forums/mailing list/newsgroups until you outgrow it. (8)What you are measuring. What metrics matter to you? This should also include how you will react to these metrics. How will these metrics change your actions? Most businesses have discovered that word of mouth advertising and networking are two of the most successful ways to find new business or clients. Social media is simply a way to network and use word of mouth, online. Small and Medium size business, especially in healthcare, are seeing the most benefits from use of social media. Even hospitals have got into the act. Check this Hospital Social Network List by Ed Bennett comprising of all the hospitals in the US on Social Media. The Presentation below has just been voted amongst the top 3 presentations of 2010 on Slideshare. If you are not using social media strategies in your marketing plan, Now is the time to start. The all consuming influence of social media is being felt in the once conservative field- Healthcare. Here is the keynote presentation Shahid Shah and Joel Selzer delivered at the Healthcare New Media Conference in Chicago, June 14th. View more presentations from Joel Selzer. Most regulatory and legal departments in pharma industries are wary of social media and other similar marketing efforts. But the large gains possible by using this collaborative channel to connect with the end customers cannot be wasted.So how do we make the best use of #HCSM? It needs a lot of planning and internal discussions. Check the slide show below for some interesting points by Rich Meyer. 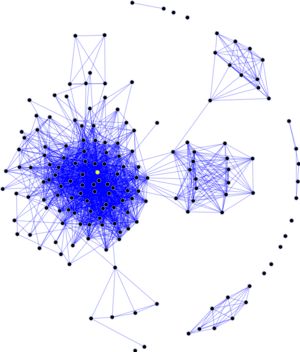 >Pharma Marketing Meets Social Media: Can the Two Co-Habitate? The use of Social Media in Pharmaceutical is highly debated, but there is no getting away from the importance it can play in the markets. To see a complete list of all social media efforts, check the wiki maintained on Dose of Digital. This wiki is meant to house every Social Media project that has been created by pharma (or healthcare companies in general). The Pharmaceutical Research and Manufacturers of America (PhRMA) represents the leading American pharmaceutical research and biotechnology companies, with a mandate to conduct effective advocacy for public policies that encourage discovery of important new medicines for patients by pharmaceutical/ biotechnology research companies.The PhRMA is active on Twitter , and makes good use of micro blogging services for advocacy. Regarding use of social media tools for medical marketing and public access to trustworthy Medical information online, the trade group proposed a paid search format somewhat similar to that proposed by Google. 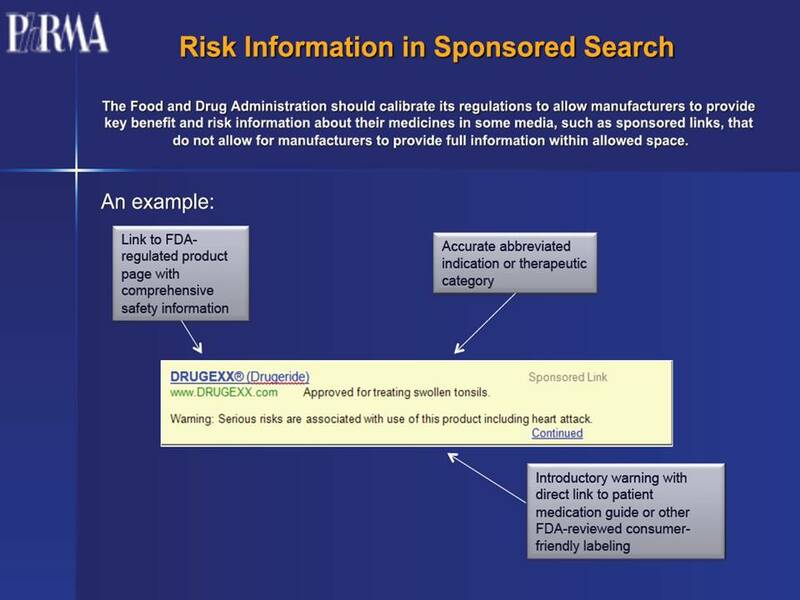 PhRMA’s format would feature the drug’s branded and generic name, followed by an “abbreviated indication or therapeutic category,” and then, in the left hand corner, an FDA logo reading “FDA regulated” that links to risk information, along with a line warning of risks and linking to the patient medication guide. You can read the detailed comments here. In continuation of my last post on FDA meet regarding “Promotion of FDA-Regulated Medical Products Using the Internet and Social Media Tools” hearing, Heres the schedule and speaker list.Kindly note that this is only the first version and likely to be tweaked later depending on speaker availability at that time. follow the hashtag #fdasm on Twitter.